A new offering from OpenService ensures that retailers can take advantage of the move towards online retail by encouraging customers to take the retail experience with them when they leave the store. OpenService’s out-of-the-box digital signage solution allows retailers to assist customers with in-store purchases, update prices from anywhere at anytime, gamify the retail environment, share content from screen to screen, create wish lists that can be sent to a customer’s mobile via SMS or run ‘loyalty’ and ‘just-in-time’ promotions from the one touch point. 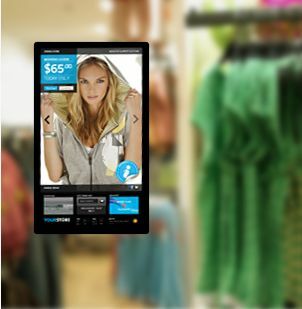 OpenServices offers out-of-the-box screen solutions for both large and small retailers. Utilizing established standard retail fixtures, as well as offering the option of incorporating existing screen hardware, OpenService retail screens are tough enough for retail conditions. An easy to use content management system allows for quick and seamless updates and the ability to either broadcast updates once to any number of devices or custom update each device with localized content.